Sometimes gaming snacks are required that aren't too messy. Biscuits are perfect. I do like the Jam and Cream ones that are always first to go in biscuit tins so often buy them in packets by themselves. It feels naughty, as if I'm defying the laws of tea-time that state that the less exciting biscuits must be consumed in an equal proportion to the superstars. This variety is even more special being strong Cherry jam and cream and chocolate biscuits. The word REAL is in capital letters so they have decided not to use imaginary ingredients like tartan jam or unicorn milk and stuck to things that border on the possible. 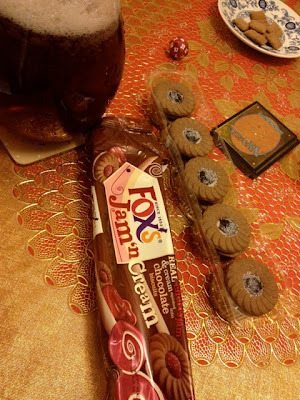 It's almost like a light bourbon version of the normal Jam'n Cream Foxes, but the cherry jam is a good deal more potent than the typical red flavour used. This would be nice, but it kind of fights with the chocolate a bit too much. It creates a nice richness to the flavours, but it's a little too confusing and I was left wondering what vanilla biscuit and cherry would be like - or choc biscuit and normal jam for that matter! Maybe there is scope for different fruits in the jams - like in the Jammie Dodger varieties, but I think most people will gravitate back to the regular ones when not looking for special treats. The saucer in the background has Somerfield's own version of Krave on it. It's decent, but not a patch on Asda's.